Some weeks ago, we released a simple BANANO Miner Faucet which unexpectedly led to a sudden rise in attention. This was somewhat unexpected since this faucet was merely made to serve BANANO’s free distribution program as one of several active faucets. However, everyone would agree that classical cryptocurrency mining is overall not a good fit for BANANO, which is based on feeless, instant transactions, doesn’t require mining, and thus can considered to be environmentally “green”. Now, the BANANO team releases a totally different, brand-new BANANO Miner Faucet! With BANANO Miner, instead of wasting power to “mine” a cryptocurrency, you help scientists doing medical research around the world to fight diseases. And you earn BANANO by doing so! Learn further below how that works. For those of you who don’t know BANANO yet: BANANO is a feeless, rich in potassium cryptocurrency powered by DAG technology distrupting the meme economy. Yes, it’s a meme coin that was forked in April 2018 from the cryptocurrency NANO. BANANO has feeless and near-instant transactions, a highly active community and is actively developed. On top of this, BANANO has memes and is easy to use, just try our slick mobile wallet named Kalium (it contains monKeys ❤). BANANO also has a free ongoing distribution through innovative faucet games. Yes, you heard it right, Faucet Games that enable you to easily earn free BANANO. You can find lots of more details on our official website: banano.cc, and you’ll find help getting started at banano.how. BANANO currently can be traded at Mercatox and Txbit.io, and it very recently also was listed at Citex and Bitmesh (see a summary of all trading pairs here). Current market data is available here at Coingecko. Our previous BANANO Miner Faucet actually mined the cryptocurrency Webchain and paid, in a heavily subsidized way, in BANANO. The new BANANO Miner is different. It supports Biomedical Research! 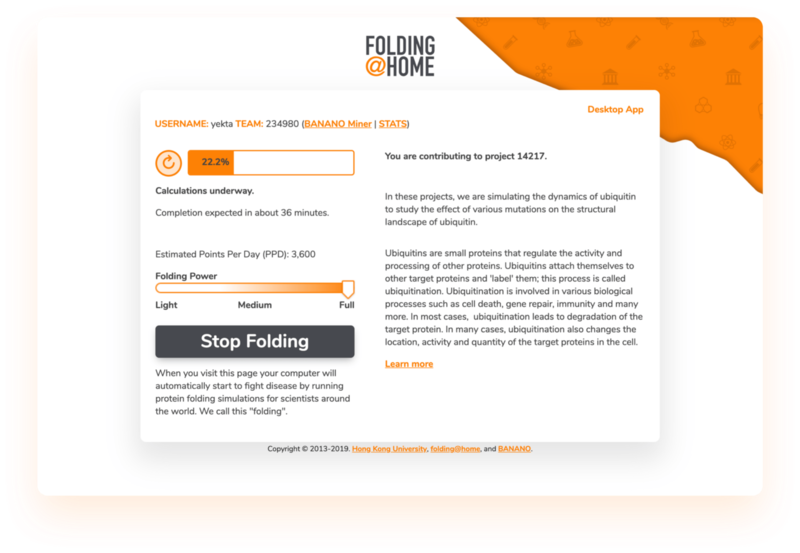 Instead of running arbitrary calculations to “mine” a cryptocurrency, your computer runs protein fold simulations through Folding@Home, which helps researchers fight Parkinson’s, Huntington’s, Cancer, Alzheimer’s and many more genetic diseases, and infectious diseases. Then, we send you BANANO depending on the size of your computational contribution. Just leave the BANANO Miner website open, your computer automatically does all calculations and accumulates points, which then will be converted to BANANO. BANANO payouts will start automatically once you reach 100 points, then up to twice per day. 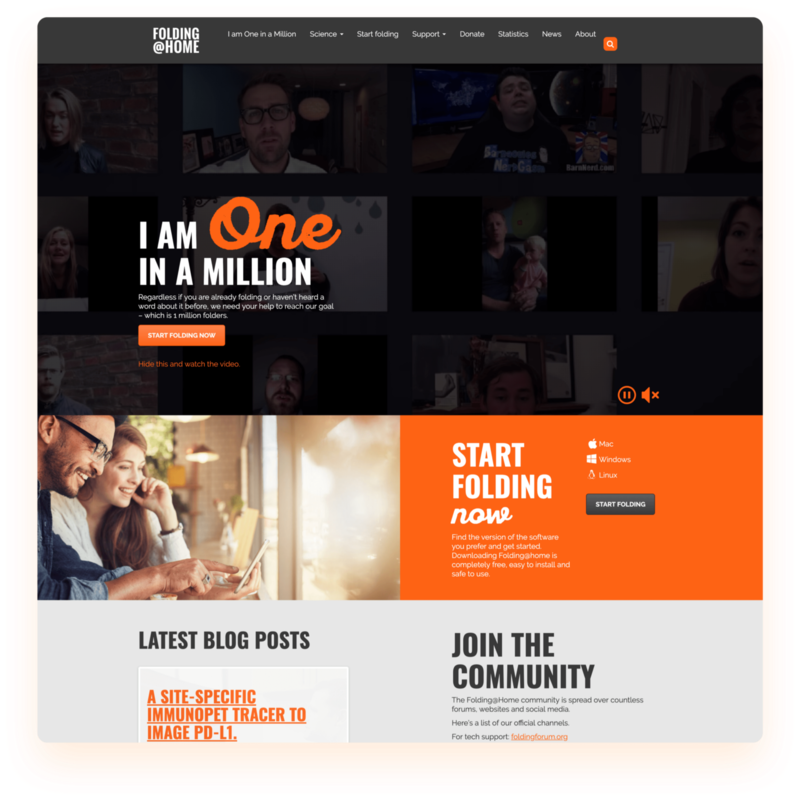 Folding@Home also has a desktop client that will work as well. You can follow the contribution of “Team BANANO” here on our team stats page. 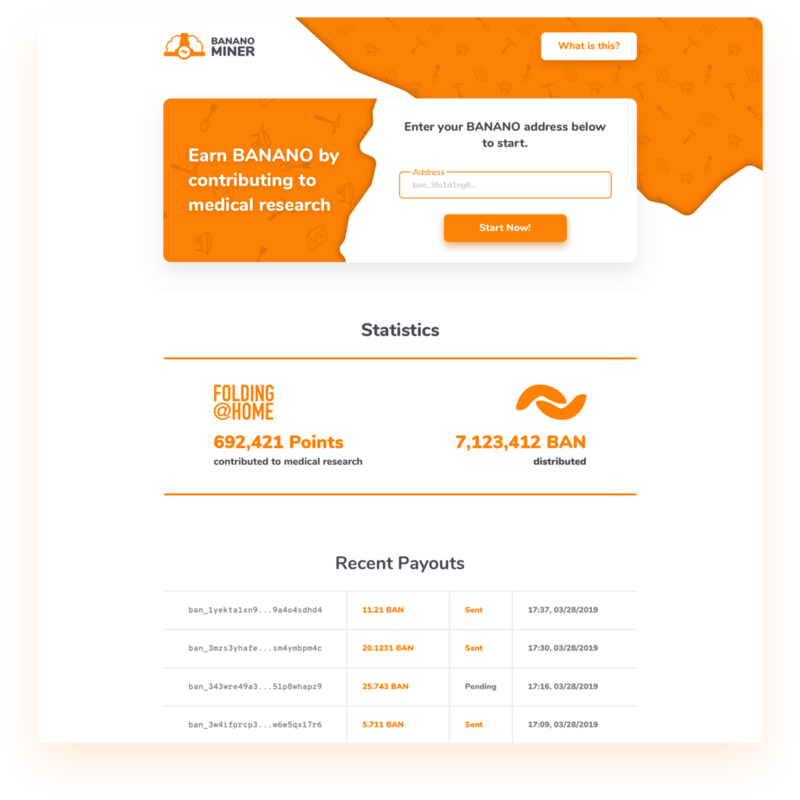 Now get started at bananominer.com! 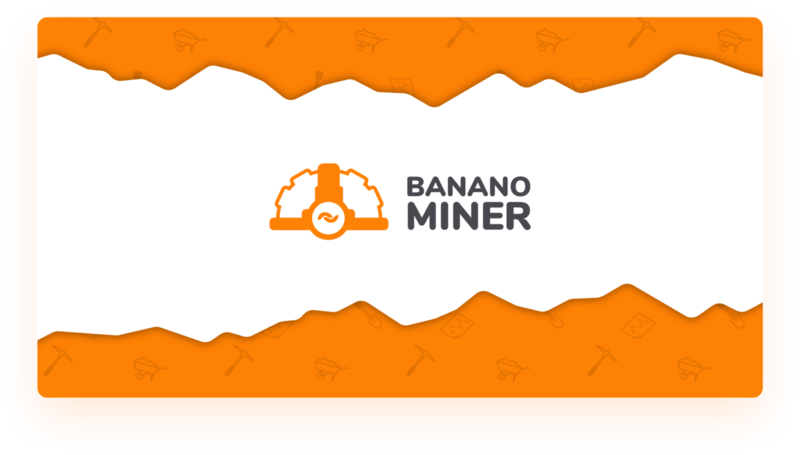 Indeed, the criticism towards mining is not new, however it’s rarely mentioned that some fresh cryptocurrencies like BANANO (and it’s father NANO) do not require mining and therefore are highly innovative examples for “green” cryptocurrencies. At this occasion we on purpose branded our new Folding@Home Faucet “BANANO Miner”: To raise awareness that cryptocurrency mining is not without alternatives. Tell us what you think about all this! Leave a comment below! What Happens to the Previous BANANO Miner? Even though based on classical mining, we will keep the previous BANANO Miner Faucet running for now and leave people the choice which faucet they want to assign their computational resources to. It will, however, shortly be renamed to “BANANO Miningpool”.